Luscious, sensual, juicy mango is Latin America’s Garden of Eden fruit. Who can resist its seductive charms? 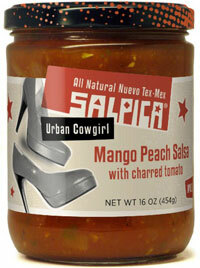 Mate it with juicy ripe peach, smoky chipotle chiles, fire-roasted tomatoes, well, the result is certainly something you'll get an itch for over and over in Salpica Mango Peach Salsa. 16oz. Diced tomatoes in tomato juice (calcium chloride, citric acid), tomatoes, mangoes, peach concentrate, tomato paste, onions, garlic, brown sugar, dried red chiles, cider vinegar, chipotles in adobo (chipotle peppers, tomato, salt, paprika, vinegar and spices), orange juice concentrate, cilantro, salt, natural flavors. All Natural. No Preservatives.